Personal Care Ingredients Market size was over USD 8 billion in 2016 and is anticipated to witness growth at a CAGR of 5.4% over the forecast timeframe. Personal care ingredients market growth is propelled by its increased demand in cosmetic industry. The exponential rise in population is expected to boost the product market between 2017 and 2024. The rising per capita income of the people has led to an increased purchasing power, which has led to the growth of the personal care ingredients market. There has been a drastic change in the living standards of people. The rising awareness about the chemicals and other ingredients used in the products will leave a positive impact on the product market. The increased focus of the geriatric population on anti-aging products will drive the personal care ingredients market. The growing awareness about synthetic chemicals will continue to boost the natural personal care industry. Formulators are constantly innovating specialty ingredients to use in the composition of personal care products, which has noticeably improved the performance of the products. The growing acceptance of performance oriented ingredients will drive this promising sector. For instance, preservative boosters such as glyceryl caprylate and caprylyl glycol are being extensively used in place of traditional preservatives, as they impart emollient properties to the formulations. Regulations play a crucial role in shaping the future of the personal care ingredients market. The U.S. and European Union have implemented certain regulations on the use of personal care ingredients to ensure the safety standards. This will adversely affect the product market. Authorities concerned with personal care industry have banned many ingredients in Europe. The personal care ingredients can be segmented into several products such as surfactants, emollients, emulsifiers, conditioning polymers, rheology control agents, antimicrobials and other ingredients such as colorants, preservatives, solvents, etc. In terms of revenue, conditioning polymers segment is estimated to grow at a fast pace with a CAGR of 6%. They are mostly used in hair care products to provide a smooth hair texture. Emollients are anticipated to grow at a high rate, owing to their usage in almost every product such as deodorants, cleansers, shampoos, antiperspirants, etc. They provide smoothing and soothing properties to the skin. Emulsifiers are widely used in creams and lotions to form a homogeneous mixture of oil and water. In terms of revenue, antimicrobials held a market value of USD 2.2 billion in 2016 and the segment is expected to grow at a robust pace. They inhibit the growth of microorganisms such as viruses, bacteria and fungi. Rheology control agents such as organo-clay and cross-linked acrylic polymers are used to maintain the consistency in personal care products. Surfactants are used in skin care and hair care applications. They can be artificially synthesized as well as naturally derived. The product finds application in various segments such as hair care, skin care, oral care, cosmetics and others. Skin care segment is expected to witness the highest growth over the forecast period. This segment was valued at USD 2.7 billion on 2016 and is expected to grow at a robust rate. Skin care products include products include lotions, creams, moisturizers, sprays, baby care products, etc. In hair care sector, the consumer preference has shifted to water-based products due to ease of use and minimal hair damage. This trend has motivated the manufacturers to develop mild ingredients. Hair care products include hair oils, shampoos, hair masks, conditioners, hair serums, hair straighteners, hair sprays, etc. Active ingredient delivery systems have been popularized in cosmetic industry which will considerably boost the personal care ingredients market. Oral care products maintain oral hygiene and are used as breath fresheners. Products which lie under this category are toothpaste, mouthwash, etc. 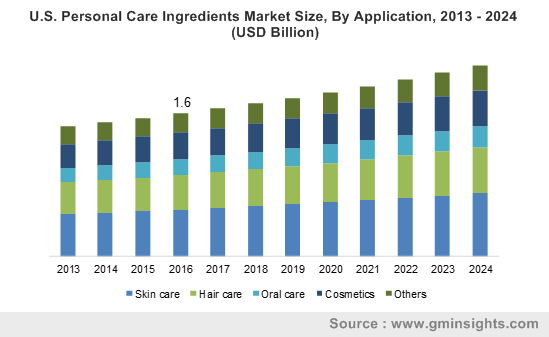 The personal care ingredients market in Asia Pacific is estimated to display healthy growth in the forecast timeframe, owing to the increased demand for personal care products. The developing nations such as China and India have witnessed an enormous demand for personal care products over the past few years. The cosmetic industry in North America will register a significant growth in future, due to the high consumption of premium make-up products. The cosmetics segment held recorded a market value of USD 0.3 billion in 2016. Hair care and cosmetics segments are likely to grow at the same pace in Brazil. Potentially harmful ingredients such as parabens will witness a decline in consumption in the U.S. due to the strict regulations of government authorities. The personal care ingredients market is relatively fragmented with major companies holding around 45% of the total market share. The product industry has a presence of many small and medium scale manufacturers such as LotionCrafter, Naturex, etc. 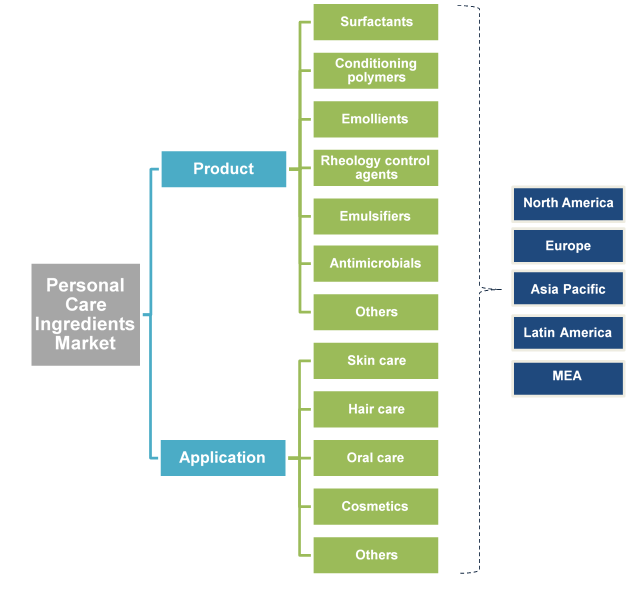 The prominent industry players in the personal care ingredients market are Evonik Industries, BASF SE, Akzo Nobel N.V., Croda International Plc, Dow Corning Corporation, Wacker Chemie AG, Ashland Inc., Clariant and Lonza Group Pvt. Ltd. Other companies include Cargill Inc., Eastman Chemical Company, Solvay S.A., etc. Most of the manufacturers have shifted from petrochemical derivatives to organic materials to meet production sustainability. The urge to look young among the aging population has fueled the demand for personal care ingredients. Huge investments in technology and research has led to the development of new chemicals and ingredients for personal care products. The ingredients provide performance characteristics such as thickening, smoothness, conditioning, foaming, etc. Increased use of dermatological products such as shampoos, sunscreen lotions and gels, creams, etc. have ramped up the personal care ingredients market.